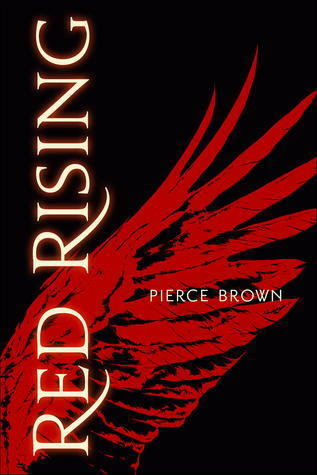 'Red Rising' takes us to a future reality where the Earth is dying, and people have started to colonise the Moon and other planets. On Mars, our main character Darrow is a Red, a miner in the interior of the planet. The Reds' job is to extract enough precious elements to one day terraform Mars and allow humans to live on the surface - Reds are the "last hope". One day Darrow discovers that this is a lie told to the Reds to keep them compliant. In fact, Mars has huge cities on the surface inhabited for generations by Golds - a higher class of people who see Reds as slave labour. A mysterious group of rebels helps Darrow disguise himself as a Gold to infiltrate the command school in order to take down the Golds from the inside. The command school is a dangerous place, with all the Gold students fighting each other for the chance at the best start to their career. It's quite difficult to introduce this book without spoilers! I went into it not knowing what it was about, only that it was set on Mars. I like going in "blind", as it means I am more open-minded about what's inside! I enjoyed this book immensely. Darrow is believable, and I cared about what he cares about - his attachments to loved ones feel genuine and part of who he is. 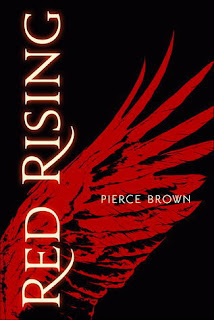 I really like Pierce Brown's characterisation. I liked the way he includes various different personalities within Reds and within Golds, showing that the "Colors" are not just a stereotype, despite the initial characteristics from their breeding. We also learn about other Colors briefly, but I have a feeling that these groups will be fleshed out in the next books in the trilogy - also I don't want to give those away for you! They're just very clever factions of society that make sense as a whole. Of course, it's limiting that one's parents, siblings, spouse, children and so on are all the same Color and therefore only ever capable of that one role in society, but that's what the book illustrates is wrong with humanity - that's why Darrow wants to overthrow the leaders. I am always a little wary when I see reviews saying that books are amazing or on the contrary, did not "live up to the hype". I don't take any notice of hype, especially when it comes to Young Adult novels. In this case I trusted my own judgement from the summary which I read when I first bought it, and I knew I'd probably like it! Even if you think you don't like Young Adult books, I still recommend this novel for anyone with a cursory interest in different societies and world views, as well as any fascination with terraforming other planets or with Roman gods/archetypes which are used a lot in Gold society. I'm certainly looking forward to book 2.